Welcome to a series of talk on the virtues of Masjid Al-Aqsa. We start again today with a poem “oh beautiful city, oh holy city, let them not pollute your purity, may Allah protect you o city so fine, o Jerusalem are you not the essence of Palestine lovely Palestine. Now unfortunately the hadeeth most of us quote when we’re referring to the first Qiblah is to say that after 16 or 18 months after hijrah the qiblah was changed from Al-aqsa to the haram of Makkah. 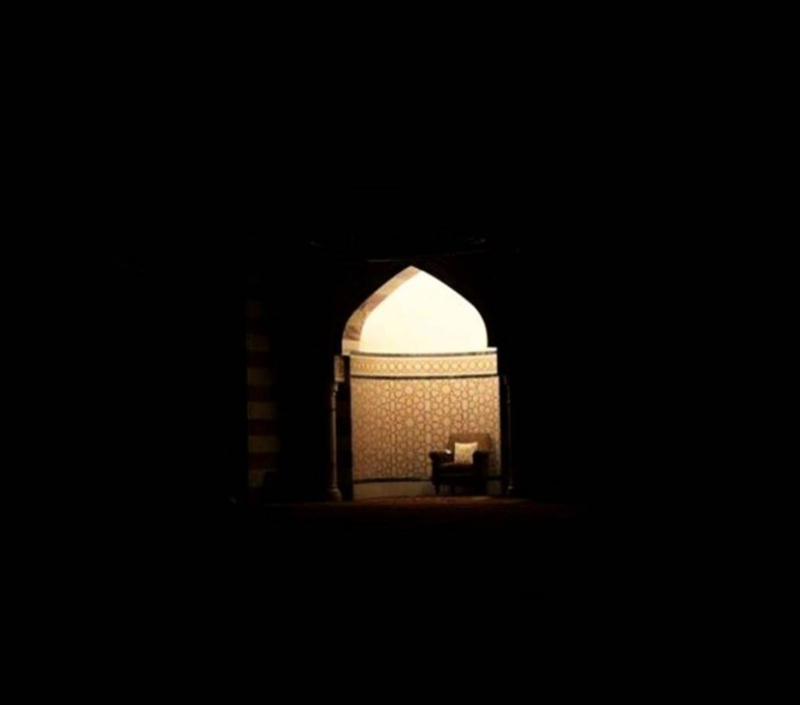 Subconsciously we think that the Prophet (Peace and blessings be upon him) only prayed for 16 or 18 months facing Masjid Al-aqsa and this could not be further from the truth because throughout the Prophets life in Makkah before hijrah (migration) he use to face Masjid Al-aqsa for salah (prayer) and we also know from the seerah that although salah was made fardh (compulsory) in the night of Al-isra/Me’raj the Prophet (Peace and blessings be upon him) immediately after nabuwat (prophethood) use to perform Salah (prayer), and there is a biography quoted by ibn Ishaq that a man came to Makkah and he asked Abbas ibn Muttalib and asked him when he witnessed the Prophet with 2 other people as to what they were doing and he turned around and said I have never seen anybody before do this and these were the only 3 people and they were the Prophet (peace be upon him), Ali and Khadija, 3 of them were the only 3 muslims in this world and they were performing salah (prayer) facing masjid Al-aqsa. So within the framework of muslims is the ideal concept that masjid Al-aqsa was the first qiblah but the prophet (peace and blessings be upon him) himself spent 12 years of nabbuwah (prophethood) in Makkah and thereafter 10 years in Madinah but of those 16 to 18 months while he was in Madinah he also faced Masjid Al-aqsa, in fact for nearly 13 and a half years of his life the prophet (peace and blessings be upon him) faced masjid Al-aqsa for salaah. What we’re trying to say here that most of his life (the life of the prophet peace and blessings be upon him) he spent majority of that time facing Masjid Al-aqsa rather than the haram of Makkah. 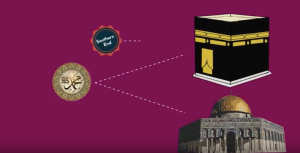 This is not at the expense of the haram of Makkah or Madinah Munawwarah, they have their own elevated status but we have to build up the love for Majid Al-Aqsa, the holy Quran in Surah bakarah has great long verses in which Allah tells us the merits of why the qiblah was changed and how and what impact it has. This is Masjid e Qiblatain in Madinah Munawarah and it is something that we need to (whenever we go for umrah or for Hajj) to visit Masjid e Qiblatain and to remember that this is a place where the Musallis while they were in prayer changed from the Qibla of Al-Aqsa to the Haram of Makkah. And also it may be befitting in there to remember and to make dua for Masjid Al-Aqsa by facing the haram of Makkah, to say that the Qiblah that was once ours has become very difficult for us to visit and make dua that Allah take you that he has brought you to the Masjid e qiblatain and that he has taken you to the second qibla the haram of Makkah and also takes you to the first Qibla the Qibla of Al-Aqsa. Al-bara had approached the Prophet (peace and blessings be upon him) and told him of what he had done the Prophet (peace and blessings be upon him) turned around and said if you had done what had been instructed to you then that would have been your Qiblah, a clear instruction that he should’ve not changed the Qiblah without having the prior commands from Allah. This also gives us a very strong emphasis that the Prophet (peace and blessings be upon him) did not face the haram of Al-Aqsa because he wanted to. He did this because he was commanded to by Allah and the fact that the Prophet (peace and blessings be upon him) after hijrah did not change the Qiblah without waiting for a command from Allah. 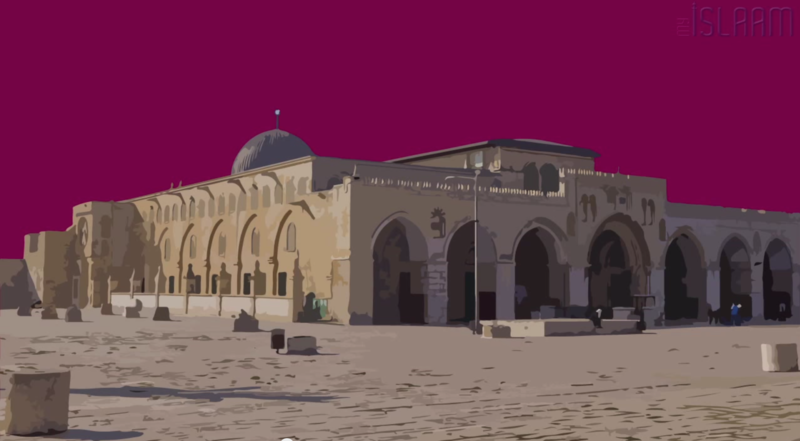 It’s indicative that it was Allah that had made Masjid Al-Aqsa the first Qiblah for this Ummah. And only when Allah commanded the Prophet (peace and blessings be upon him) to change the Qiblah did the Prophet (peace and blessings be upon him) change the Qiblah. Despite the fact that the Prophet (peace and blessings be upon him) in his heart of hearts after the hijrah (migration) felt it better for him to be facing the haram of Makkah for salaah (prayer) but he still had to wait for the commands of Allah to change that. Muslims hold all these prophets in reverence and because all these propehts are connected to Masjid Al-aqsa you can see the reverence and importance Masjid Al-Aqsa gains in the hearts and the minds of a believer and its greatness as I mentioned to you doesn’t simply stem from minor events that took place either in modern history but it goes back to the creation of mankind himself from Adam (peace be upon him) and all these great prophets who are mentioned in the holy Qura’an. As Muslims we do not differentiate one Prophet from the other apart from accepting from the fact Prophet (peace and blessings be upon him) is khatamul ambiya (the last of all prophets) he’s the last of all prophets and he is the leader of all prophets but we treat all the other prophets as equal and all these great prophets had great connection from Adam (peace be upon him), Sulaiman (peace be upon him) Dawud (peace be upon him) Ibrahim (peace be upon him) yaqoob (peace be upon him) all these prophets have had a direct and indirect connection with Masjid Al Aqsa and the surrounding areas of Jerusalem and therefore it is very important for us to hold close and regarding Dawud (peace be upon him) in surah Sa’ad there is a beautiful verse “has the story of the litigants reached you of those who entered the private chambers by climbing in over the wall as they came upon Dawud (peace be upon him) he was frightened of them, they say be not afraid we are just two litigants one of us has committed excesses against the other so judge rightly between us and be not unjust and guide us to the right way” this event is narrated in the holy Qura’an as I mentioned where Dawud (peace be upon him) was in his mihrab while he was busy reciting prayers praising Allah, the mihrab referred to here in the holy Qura’an most people believe it was within the sanctuary of Masjid Al-Aqsa. The mihrab of Dawud (peace be upon him) is thought to have existed and we don’t exactly know where it was this is how amazing alive the history and the geography of Masjid Al-Aqsa brings a believer close to all the prophets that are mentioned in the holy Qura’an and of course the glad tidings given to Maryam (peace be upon her) about the birth of Esa (peace be upon him) was also taken place in Masjid al-Aqsa. There’s another verse in Surah Al-imran where upon it says “there upon her lord so graciously accepted Maryam and honoured to her a goodly growth and placed her in the care of Zakariyyah, whenever Zakariyyah visited her in the sanctuary he found her provided with food he asked her Maryam how do these come to you because there were fruits out of season, there was beautiful fruits out of season she said it is from Allah. Allah provides sustenance to whom he wills beyond all reckoning. Again this great miracle, where did this take place. This took place in and around Masjid Al-Aqsa. Therefore it is imperative that this blessed land and this area is something we should derive benefit from and we should all make dua that Allah take us there to visit this place so that we can gain from this great blessings that Allah has bestowed for this ummah.